I made this apron from Amy Butler's Domestic Goddess apron pattern. I think she might be one of my favorite characters on the show, after Violet, the Dowager Countess of Grantham of course. The Dowager has the best lines in the show, bar none. I do like the deep pockets and the extra length to guard my trousers, but I look a bit silly in it. I don't think an Empire Waist is very flattering on my body type. Ho hum. Did you know the term "empire waist" is from Napoleon's time, and it was so called because all the fashionable ladies of the era wore this type dress in the French Empire, which then took hold in the British Empire... just a trivia tid bit. I want to make a design wall so I can stick up these squares and arrange them as needed. I'm thinking of DIY-ing it with cardboard boxes and felt. Have you made a design wall? What materials did you use? The purple triangle make is going to be a table runner, just waiting on batting to arrive, c'mon mail man. This was my first try at using the 60 degree triangle tool at Missouri Star Quilt shop. I love her quilting tutorials, have you seen any? Google her on You tube, she shares a treasure trove of information. Time to give English Paper Piecing a go. I'm learning to use a new lens on the camera, bare with me LOL. We all know who the real boss is around here. OMG love this post. 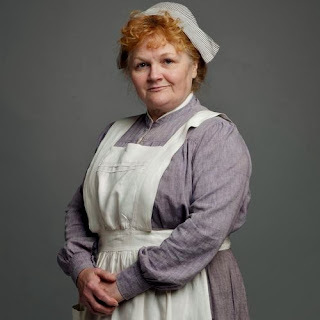 and Mrs Patmore,,she is fab... She might be taller than you....lol The apron would fit me...Amazon woman..but skulls..um.....ha,ha,ha. I want you to teach me paper piecing, have always wanted to try it. I had a flannel board for piecing together a scrappy quilt once...I am pretty sure it was flannel and they stayed on it on the wall, could move them around. Love the boss in that pose. And 4th season DA starts SUNDAY!!!!! Can you get it now? I am recording it. That is a beautiful apron. I never wear them, but I should and probably full length would be a smart idea, lol. I won some patterns with aprons, so time I start using my sewing skills again. Ooh, the paper piecing looks so pretty! So gorgeous! And the apron is lovely! Would you wear it more if it was shorter?